SOURCE: Given by publisher, in exchange for an honest review. Nova is not your average magical realm. The princess has accidentally poisoned herself with a love potion meant for her crush, and now she's crown- over-heels with her own reflection. Oops. To save the kingdom, her royal parents announce the Wilde Hunte: a national quest to find the magical ingredients needed for her cure. Is Samantha Kemi, an ordinary girl with an extraordinary talent, up to the challenge? And just how close is she willing to get to Zain Aster, her dashing classmate and rival, in the meantime? To add to the pressure, this quest is ALL OVER social media. And the world news. No big deal, then. What I loved about, 'The Potion Diaries,' is that it is such a distinctive and eccentric YA book, and is very different to what I have read before. Princess Evelyn has poisoned herself with a love potion, and has quickly and dangerously fallen in love: with her own reflection. This calls for a hunt to be commenced, with a handful of alchemist families battling it out, to find the cure for the princess- as her health is slowly deteriorating. Samantha Kemi is a member of the, 'Kemi,' family- one that used to be known in the potion making community. In an attempt to get the family name back into the world, Sam joins the hunt; to find the ingredients needed to cure Evelyn. But there is one thing that could stop her; he goes by the name of Zain- and he could be stopping Sam from winning the hunt, in a lot more ways than they both know. Amy Alward is an author to be on the watch for: I felt that her writing was so magical, that she was prancing around my page, sprinkling her spellbinding magic dust across them. I especially liked one of the main protagonists: Sam, as she is gusty, strong and talented; traits that adolescents can aspire to have themselves. The plot itself chugged along like a train, as it wasn't too slow, and not too fast- the perfect speed. I really did enjoy the individual elements of the book, as the facades to obtain each ingredient would be very avid and filled with suspense for any reader. 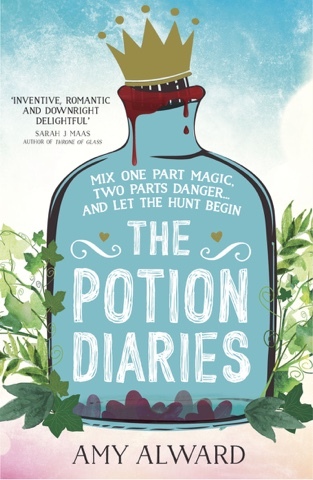 This novel is a firm 5/5, as it will inflict you with a potion, so you can't put it down!